Did you know the building going up across from Timberwood Elementary off Glenrose will be a 16 unit assisted living facility? The fire Marshall contacted the neighborhood to remind us all that we need to seek permits to meet county standards for fire, etc. when building. While this is not technically in the Timberwood Park “proper” development, it does skirt our development much like the developments/homes which surround our development. Did you know the building site for the new fire station is well underway on Canyon Golf? If you travel that way on a regular basis you have probably noticed the construction work at the site which is between the Overlook Parkway intersection and the Wilderness Oaks intersection on Canyon Golf. We’ll have a new state of the art facility right outside the back door of Timberwood to enhance our volunteer firefighters already located on Borgfeld Road. The October board meeting was scheduled once again to be the same night as National night Out is in our neighborhood. Because of that, the board meeting was moved to an earlier start time which was confusing for some of our regular attendees who thought the meeting time was same as always. This meeting is important to the neighborhood, especially since we only hold every other month meetings. It’s the meeting where candidates introduce themselves to the audience and talk about their interest in running for a position on the board and serving our community. I’ve often wondered why the October meeting couldn’t be scheduled for a different night and time so as not to conflict with National Night Out, especially since it is the ONLY opportunity for candidates to introduce themselves to the neighborhood prior to the election held in December. Barring attending the remaining neighborhood activities and events up to election time, there isn’t any other face time scheduled for candidates to answer community questions and concerns and learn more about them. Finally, this year the board indicated they would no longer hold the meeting the same night as National Night Out beginning next year. Whether that holds as the new plan or not remains to be seen since the current President, Greg Matula and Vice President, Scott Myles are not running for re-election. Greg made the announcement that the change would be made beginning next year. Hopefully, the board will adopt the decision to hold the meeting on another night to allow better opportunity for neighbors to meet the candidates. Again, I apologize in advance if I got anyone’s name incorrect. Send me a message and I’ll correct and resend the information to our neighbors. Once I have the names fully correct I’ll send out updated blog information to ensure you all have the names correct going forward. There was little documentation provided at the meeting, with the exception of a 3 minutes speech each candidate who was able to attend the meeting gave, and bios provided by Paul Rutkowski and David Kanter, about the candidates. Wouldn’t it be great if the board set up an opportunity for the neighborhood to be able to stop by and meet and greet the potential candidates between now and election time in December? It would be a simple matter to use the clubhouse and/or pavilion and schedule a couple of opportunities for the candidates to be available to the neighborhood to meet and ask questions of. What do you think neighbors? Would you like to have the ability to meet, speak to, ask questions of and learn more about your candidates? It’s a difficult process to make a decision on a proxy or absentee ballot when you have no working knowledge of most or all of the candidates. This should be a part of running for office and allowing candidates an opportunity to be seen and heard by the community! Let’s see some social media feedback about that potential and see if the board will respond to the request! This year there is an opportunity to fill two spaces for certain with new members to our Board of Directors and potentially three if voters decide to make term limits a reality and vote all new candidates in to sit on our board. Diversity of thought is a good thing and new faces will allow for a difference of opinion and hopefully better overall representation in the coming 2-year session each of these candidates chosen will represent us for. Be sure to cast your vote, it really does matter! I also find it interesting that the board decides to approve the coming year’s budget (2019) at the October meeting rather than the annual meeting where property owners are supposed to be able to review the financials, see the proposed budget and vote on same. The annual meeting is typically supposed to be the opportunity for property owners to participate not only in elections, but also in business of the association, like approving the coming year’s budget. There were line item changes to the budget which are worth note. We amazingly went from previous year’s budgets reflecting $68,000 in fining income for example to $1,000 proposed for 2019. Why would that be occurring? Question was asked, and the answer provided was “we are no longer looking at the fines as income and will be accounting for them differently next year” – Huh? How does that work and where did those dollars actually go if they are still in the financials? Just one of several questions asked during the discussion of the treasurer’s report which was presented by Scott Myles due to our treasurer not being able to attend this meeting. Some of the other items discussed by the board was the fact that Spectrum hadn’t received a raise on their basic contract for 7 years and would be receiving one this coming year, with the board citing they had taken over a lot of the ACC flow of project approvals and builds, as well as other obligations the board has. A question about how it could only cost $1000.00 to maintain the golf course for the year was answered by a new mower was purchased which allowed for greens mowing and other measures and they had re-seeded it last year, so they didn’t feel it would take much maintenance. The budget was approved solely by the board, no vote from the members in attendance. Local Community News published an article which appears in this month’s issue regarding the clubhouse and some of our neighbors concerns regarding the approval process, the voting process, the price tag and more. 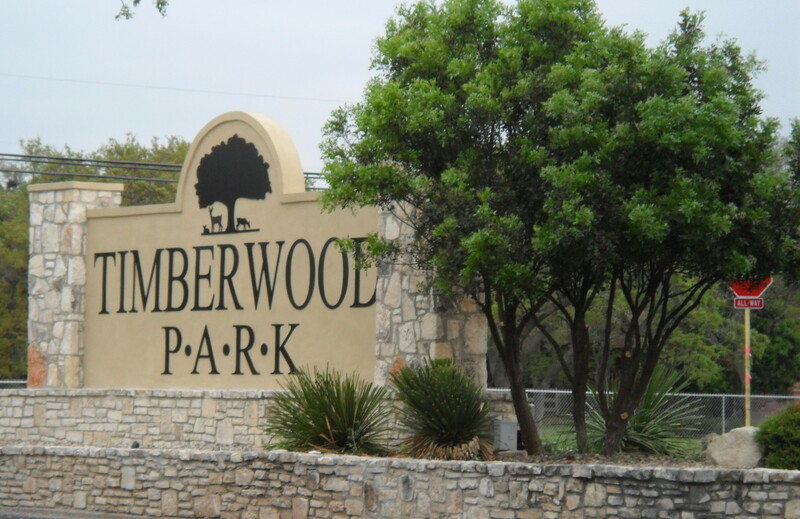 The investigative reporter found traffic about our neighborhood and the clubhouse issue by surfing the web on social media and subsequently on the Timberwood Park neighborhood page. He reached out to me and asked for comment and content for the article which he was writing. The link can be found here if you are interested in reading the content of the article. The update on the clubhouse project is summarized as: board members met with COSA for preliminary project plan review and indicated it was a success, so the contractor is now underway making actual construction drawings and documents to submit for the necessary permitting. They completed an Asbestos survey and found the old building has none of significance. Demolition permitting will be submitted in late November with early December approval anticipated. Construction is expected to begin sometime in mid-December after the annual meeting. Timberwood Elementary will be the designated meeting place once demolition takes place and until construction is completed. Construction should begin sometime in early January with the current timeline. It will be about 9 months construction time. The loan is being done through Pacific Premier Bank, the same bank that holds the reserve funds. Loan interest rate is 5.68% according to the board. Looks like a brush and bulky waste pick-up is in the works for the first week in November. Karen indicated that she thought Tiger was doing a door-to-door for small brush tied-up bunches and bulky items and also indicated that whether or not you were a Tiger customer they would be stopping. They are still working on bulky brush but didn’t have specifics for that yet since the county is no longer assisting with that. They will not take paint, tires, etc. and a list of non-accepted items will be posted in the coming weeks. This past month I was delighted to see the final steps for the Gerfers’ Cemetery to be recognized formally as a Historical Cemetery in Texas in a dedication ceremony held September 22. Here is the article link. The ceremony which officially unveiled the cemetery’s historical marker which is now installed at the site. After the 5-year process I undertook to see the cemetery be recognized and therefore preserved into the future it was rewarding to see the cemetery acknowledged and the plaque and marker be the final step in the process! There should be information about the candidates in the October and November issue of the newsletter according to the current board. Ask for an opportunity to meet the candidates and learn more about them. Look for candidates at the upcoming neighborhood events like Music in the Park and Halloween around the Lake to learn more about them. Be an informed voter and cast your vote to elect a new wave of board members who may offer a different perspective and an opportunity for more inclusion of property owners in the process of governing our neighborhood and how your money is spent! I would look forward to setting up a meeting & schedule the Clubhouse so that all the candidates Could Present their platforms( if they wish to participate) and take -for example 15 minutes- to more fully discuss their background, answer questions, etc. Great! I think candidates should lobby the board for an opportunity to hold an event at the clubhouse broadcast by eblast etc. to let everyone know they have an opportunity to engage candidates. I think the tpoaoffice@gmail.com or contact@spectrumam.com will be a good place to start asking for the event.